Google has slowly been adding replacement charging docks for the Android Wear devices to the Play Store. That's important in the case of watches like the Gear Live, which uses a special clip to charge the watch. 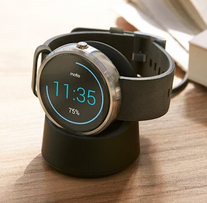 It's less of an issue for the Qi-equipped Moto 360, but the official stand is in stock now anyway. The listing for the dock appeared recently, but it wasn't available for purchase. That's changed now, and you can order it for $39.99. The 360's dock is basically a small soft touch stand with a Qi charger built in. The watch can be juiced up on another Qi pad, but the dock is a handsome little accessory that holds the Moto 360 just right. Remember to factor in tax and shipping with Play Store orders. The total cost is more like $50 with the slowest shipping method. Rather pricey.